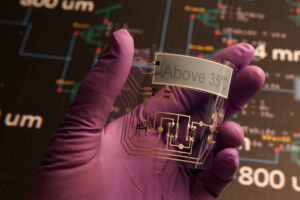 GigaOm reported that NASA and PARC were working to print heat and light sensors on thin plastic sheet that could be released over an area to collect a range of environmental information. Combining this with Big Data collection and visualization practices, this could lead to the ability to get very detailed information about a particular area without having to physically go there and set up monitoring equipment. I was wondering, however, how they would disperse these sensors. If there is no atmosphere and low gravity, would the little bits of plastic and metal simply hang about until radiation destroyed them? Would we litter Mars or the moon with bits of used sensor plastic, drifting on the solar currents? Update: I just came across this article in the Guardian that may be an answer to the question I raised in this post: create the sensors with a way to destroy themselves. The examples in the article use water to dissolve the objects, so they will have to find something else to dissolve them on planets that are lacking this solvent. PreviousThe robots are coming and they can even climb over a 2×4!